SayIt: Speech Recognition should always be this easy. SayIt works seamlessly with any EHR - no cutting and pasting! SayIt gives providers what they've been looking for: accuracy, speed, flexibility and convenience. SayIt gives management what they've been asking for: an affordable, low-overhead solution that's HIPAA compliant and enterprise-ready. See why SayIt is the obvious choice. Easy for Providers to Learn and Use: No voice training required. Work anywhere there's an Internet connection, on either a PC or a Mac. Easy on the Budget: Priced at a fraction of the competitors. Choose between "Pay as you Go" or a discounted long-term subscription. Easy on IT Support: No need to install desktop software or network equipment. No EHR integration required. Experienced: EXAQ has over 20 years experience providing effective Speech Recognition Solutions for healthcare organizations of all sizes, nationwide. Versatile and Solution Oriented: EXAQ has developed advanced clinical workflow productivity solutions for major hospitals and individual practitioners. Cooperative: Our friendly and supportive staff put your needs first to coordinate a smooth transition. No obligation trials are available. Contact us now to learn more about how SayIt can benefit your organization. "SayIt does precisely what software should do: lets me concentrate more on the patient and less on the computer." "Imagine stealing back some of the time you spend in your EHR every day. 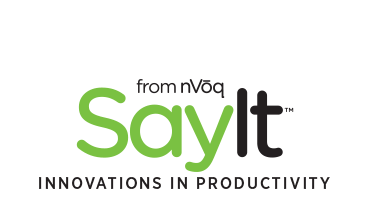 Integrating voice recognition commands into your workflow with SayIt can improve your efficiency and productivity." "The highest bandwidth communication from one physician to another is via story telling. The efficiency of storytelling derives from the fact that a well-chosen phrase brings a wealth of implied information with it, since it reaches into both parties' years of experience. Computer records don't share any common experience with anyone. SayIt technology helps bridge that gap." © nVoq, EXAQ. All Rights Reserved.